Deflections: Hey Parents! Tell us what you think. Let’s play hopscotch in a proverbial minefield. How should parents evaluate coaches? Perhaps the first question to ask is, should parents do it at all? The answer to the second question is a resounding yes. Parents ought to have the opportunity to assess their child’s experience. It’s not just because they’re footing the bill; it’s also because they have an important vested interest in the team or organization and it behooves that team to provide an appropriate learning environment. The vast majority of parents want their children’s hockey experiences to be good, safe, and fun ones. People—yes, even hockey parents—are basically reasonable. They recognize when their kids are having a good time and learning. Results may colour their views a bit, but mostly only in the extreme. The parent perspective is an important one. Whereas a coach may see a child just a handful of hours weekly, the parent lives with the kid. They see the pouts and grins and hear the comments daily. Kids are candid in their views and perceptions. If something is either amiss or going well, a parent will know. It’s through this lens that a parent can share with a team or association how the season has gone. It should have nothing to do with results, unless the team is being blown out and/or showing undisciplined behaviour. With some justification, minor hockey bodies are a bit afraid of parents. Perhaps then it’d be better if they got in front of issues through early communication and evaluations that tell parents their voices are going to be heard and their opinions, if explained rationally minus the vitriol, have merit. What can an evaluation tell us? Plenty if worded smartly with questions which don’t address either actual results or a coach’s technical/tactical skills. Team results in minor hockey don’t correlate well to coaching skills. I’ve seen many great coaches saddled with weak teams in traditionally small poorly developed hockey areas and some horrible coaches whose teams win on sheer talent. There are those, too, who opt to coach teams that have a strong likelihood of winning. How do you measure that? As far as skills instruction and practice planning are concerned, few parents are qualified to offer accurate, objective observations. They can, however, say if their child enjoyed the practices or improved over the season. They should also be able to report with some conviction whether or not the coach has created a respectful and safe environment both on and off the ice. 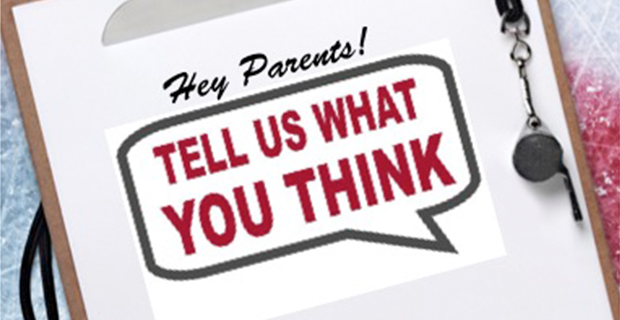 In fact, a carefully worded parent survey can put a hockey association in a positive light. It shows the parents’ observations are both valued and important.